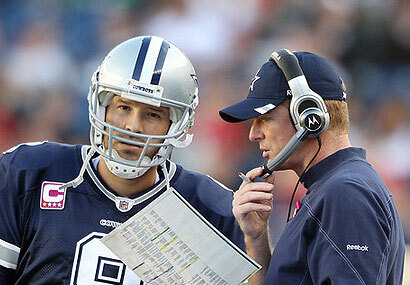 Jason Garrett should be blamed for the Cowboy's most recent loss, especially for his conservative play calling! Sunday was a busy day across the NFL, but also one that featured a great deal of surprises. Here are a few thoughts on some key issues that have been discussed by fans, talk-show hosts and bloggers across America on Monday. Patriots-Cowboys: This was indeed an epic contest that featured two teams going in completely different directions. With roughly four-minutes remaining in the fourth quarter, and Dallas leading New England by a whooping three-points, head coach Jason Garrett elected to run the ball three times, as well as punt on fourth-down, which set up the heroic Tom Brady, who led the Patriots to a game-winning touchdown. New England’s offense gassed Rob Ryan’s defense, while Garrett took the ball out of his quarterback’s hands during the team’s final few drives, and put the weight of the contest on rookie running back DeMarco Murray’s back, which probably wasn’t the right decision. Overall, it wasn’t a pretty game for either team, but an important victory for the Patriots and another heartbreaking loss for the Cowboys. Sean Payton’s Injured Leg: This was indeed an accident, but again, something you don’t see every day, right? Saints tight end Jimmy Graham caught a pass from quarterback Drew Brees and then collided with head coach Sean Payton, who tumbled to the ground on the team’s sideline. Payton was then assisted to the team’s bench and doctor’s identified his injury – a torn meniscus and fractured bone in his left leg, which was repaired on Monday. Although, while reports have stated, Payton won’t be able to put pressure on his left leg for roughly eight weeks, one might wonder if this particular accident will propel the Saints downward? Brees discussed his coach’s injury with reporters on Sunday, but didn’t seem concerned. The Saints are too good of a football team to let a minor issue, such as a Payton’s injury get in their way, especially against the winless Indianapolis Colts. Harbaugh-Schwartz handshake: This was bizarre and strange at the same time. I can’t recall the last time two coaches sparred with one another after a game concluded, but I am convinced that San Francisco 49ers head coach Jim Harbaugh wanted to rub his nose in Jim Schwartz’s face after his team’s fifth win of the season. I expect the league and commissioner Roger Goodell to fine both coaches for acting inappropriately.